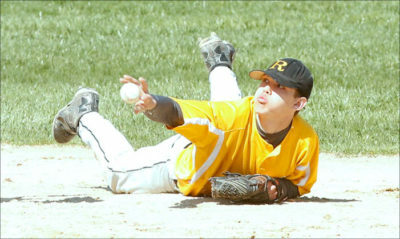 Royall hosted Necedah and held on to a 7–4 victory at Panther Park, scoring one run in the first, a pair in the third and four runs in the fourth. The Panthers jumped on Interstate 90 for a game against the Bangor Cardinals and came home with a 4–0 shutout victory. Royall took on the New Lisbon Rockets in a contest that would determine the position of the Panthers in the Scenic Bluffs Conference. In the bottom of the seventh inning, the Panthers pulled out a late victory with two runs against the Wonewoc Wolves. Royall and Wonewoc squared off in a pitching duel, and the Panthers prevailed with three runs in a come-from-behind, 4–3 win at Panther Park. The Royall Panthers opted not to play at home Thursday because of wet grounds at Panther Park, venturing to Necedah to take on the Cardinals. Playing at Cashton, the Eagles soundly beat the Royall Panthers by 14–4 in six innings. The Royall Panthers opened the 2017 season against the Hillsboro Tigers on Tuesday with a 5–0 win at Panther Park.